Are you dreaming of a relaxing vacation as the setting for your Christmas celebration? Our lodging partners Southern Vacation Rentals can make that dream happen with their selection of vacation homes in Destin, Florida that are open for Christmas. If planning a getaway is at the bottom of your list, let them take some of the weight off your shoulders. 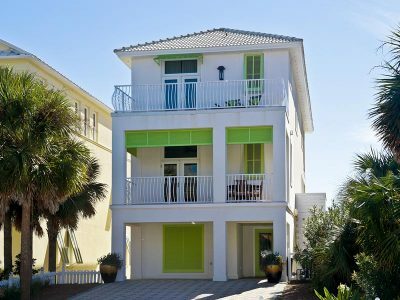 One of our top picks for your Christmas vacation is Gulf Landing, located in Destin’s Holiday Isle community. This dazzling four-bedroom home spans three stories and easily sleeps 16 guests. Invite the whole family to come along – aunts, uncles, grandkids and all! The kids will love taking advantage of the first floor at Gulf Landing since it features a kitchenette, living room, bedroom, and private bathroom. It will feel like their own private vacation home! However, the action takes place on the second floor. The living room opens up to the most dazzling views of the Gulf imaginable, with a private balcony that sits right at eye level with the water. Enjoy the convenience of a fully equipped kitchen during your stay, along with a free-standing ice maker, free WiFi, and a washer/dryer. In the third-floor master suite, recline in your plush bed while savoring the views. Also in this bedroom, you’ll find a wet bar and an expansive bathroom. Ease yourself into the whirlpool tub after a long day of fun in the sun. Whatever you choose to do, we think you’ll love it here at Gulf Landing in Destin! Of course, you should make full use of the Holiday Isle community amenities during your stay. A neighborhood shuttle is offered to transport you from your home to the pool, tennis courts, or even beach access with ease. Situated in the heart of Destin, Gulf Landing is perfectly positioned to offer you easy access to fabulous shopping and dining options. Some of Southern Vacation Rentals’ Southern Perks partners offer discounts on local businesses during your stay, so be sure to contact them to make the most of your Christmas vacation. Make Gulf Landing in Destin your new home for the holidays!